Known as the original locks used in England and Ireland, rim locks affix to the outside of the door. Easily installed and operated, they can be deadlocked from the outside with a full turn of the key and from the inside by using the attached snib. Many rim locks nowadays are fashioned as night latches, but at Ironmongery Experts we have a large variety of rim locks for sale as well. 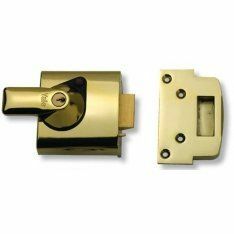 Contemporary rim locks and night latches are almost a combination of the traditional mortice deadlock and the more accessible mortice sashlock, similar to the mortice bathroom lock. Unlike mortice latches their bolt can be locked in place from both sides, regardless of whether the lock is in open or closed position. This places them among the most versatile locks & latches we supply. Available in a variety of chrome and brass finishes, our rim locks & night latches come in several models including rollerbolt, contract, cylinder and auto deadlocking. However, if you’re looking for something more modern, our range of digital locks might hold exactly what you need. These locks come in many sizes and forms, but are all operated with the use of a customisable passcode as opposed to a key. Robust and efficient, locks like these are usually reserved for the workplace or those wishing to protect large quantities of valuables. For those with less common door types, consider browsing our collection of rebate sets and sliding door locks and latches. Designed to fit squarely into even the most creative of doors, you’re sure to find a size, colour and design you enjoy. If you’re looking for a more industrial approach, our budget locks and fire brigade locks won’t let you down. Built for strength and security in any weather, these locks utilise specific universal keys and are therefore less suitable for home use. In the case of domestic application, we stock a sizable variety of magnetic catches and roller catches. Constructed with ease of use in mind, these fixtures will keep your cupboards, wardrobes and internal doors safely closed when not in use. At times though you may require a hefty, outdoor alternative to keep your environments secure. In cases like this, our assorted array of padlocks are perfect for the job. Compact, durable, and available in many different styles, they’ll remain strong and rust-free for years to come. For expertly crafted fixtures and fittings, Ironmongery Experts has you covered.